I can hardly believe I made it! Thirty-one straight days of writing about one of my favorite topics, the Blessed Mother, in one of my favorite months, October, the month of the Rosary. Today is Halloween, and it is busy! 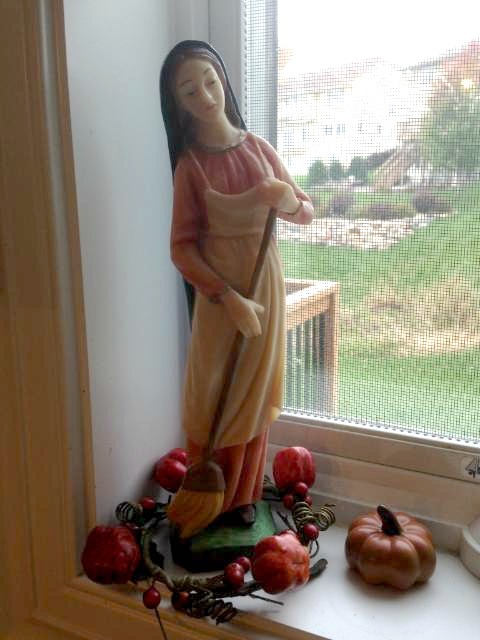 I talked about busyness yesterday, and I pondered how Mary would have handled it. We are gearing up for a fall birthday party with Greg’s side of the family, followed by trick-or-treating on this rainy Halloween. This morning, I am just getting back from a gluten-free/allergy-free cookie class, and Greg is taking two daughters to theater. I have a lot to do before the party begins, and so this series won’t end with a bang. But it will end with praise and thanksgiving: Thank you, Lord, for sharing Your mother with us. And thank you, Mary, for being a mother to me. On this day we give thee our love. Trusting thy gentle care to prove. Dearest Mother, thy sweet care. Wander from they guiding way. 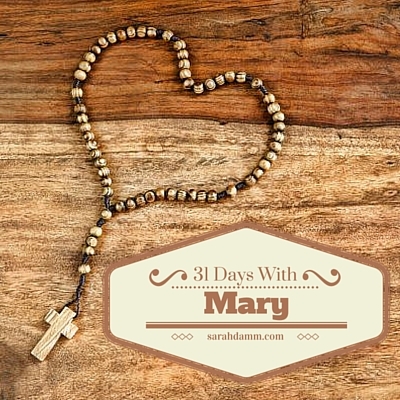 Day 30 :: 31 Days With Mary—What Would Mary Do? Thank you for stopping by! I’m so glad you’re here! I’m Sarah, and my prayer is that you find the hope and encouragement you need within these pages. To learn a bit more about me, click HERE. Stay in touch! Subscribe to my emails! Sarah Damm is a participant in the Amazon Services LLC Associates Program, an affiliate advertising program designed to provide a means for sites to earn advertising fees by advertising and linking to Amazon.com. This means that when you purchase items through Amazon links on this site, you are supporting this website. Thank you!